Blog | To juice or not to Juice | Blog | My personal mind over matter choice to eat healthier. 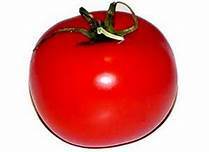 I will share the recipes I make every day. My personal mind over matter choice to eat healthier. I will share the recipes I make every day. You are what you eat. Did I read that right? 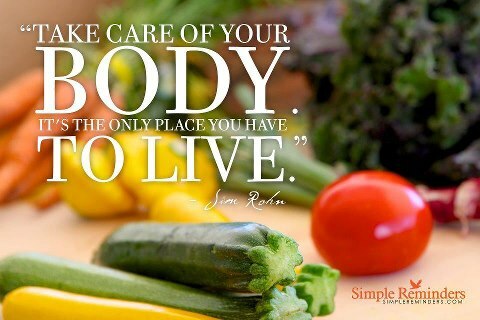 So, what did you do today to take care of your body? For breakfast my husband cooked egg beaters with spinach and Morning Star Veggie sausage. It was very good I have to admit. Was a little nervous about it. I just found another great meal with a spinach burger from Morning Star. I will have to check that out too. For lunch, there is a neat little restaurant near me called “the good bite“. They are vegetarian and some vegan. It is just 2 doors away from my Trollbeads Jewelry store in Lake Placid, NY. It has been opened for about 1 year. They had Chili with yogart and cornbread. EXCELLENT. You need to find them if you visit Lake Placid, NY. Then, I juiced. I bet you already knew that. 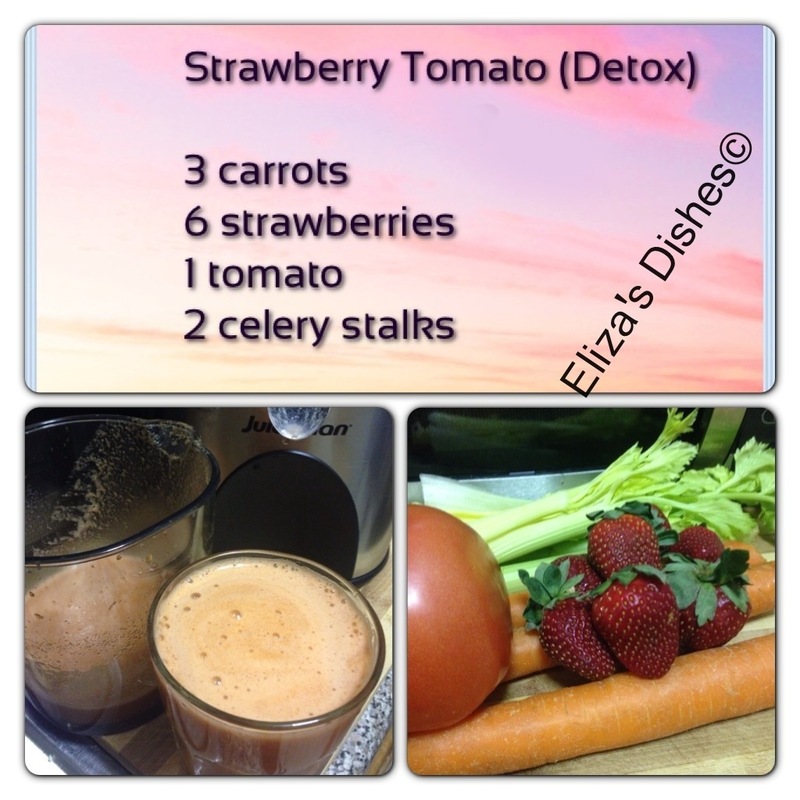 My juice today, 2 cukes, 10carrots, 10 celery, 1 radish, 1 tomato, 4 apples (No pear…we were out). Made enough for my husband to have a glass too. I have lost 20 pounds so far and feel great. This is a life change, not a diet. It’s all about the choices we make every day. So, we are what we eat. What a great way to start a Monday. LOTS of juice with fresh fruits and veggies. I made enough for breakfast and lunch. 10 Carrots, 6 celery, 2 cucumbers, 1 radish, 4 apples, 1 pear, handful of fresh green beans and asparagus. I really was good and more pulp than I usually get in my juices. I have never tried to juice green beans or asparagus but it came out fine. I was going to add another carrot just in case it was a little bitter but did not have to. I brought my “juicing bible” to the store with me, to pick out a new juice for tomorrow. I can’t say I am stuck with the same juice everyday because I change out some of the ingredients. But I really like this one and tend to make it a lot. Of course, it will have to include the same fruits and veggies my husband just bought so they don’t go bad and I don’t want to go back to the store. hmm what to do. Do you have a favorite juice or your goto juice? Feel free to share. What exercise have you done today? At -14 this morning, I walked the dog 3/4 miles around the block and walked my 1/2 mile to the store. By the time I was walking to the store it was 15 degrees. Good thing was no wind. Still have to walk my 1/2 mile back to the car and another 3/4 mile walk with the dog tonight. May add 20 minutes on the rowing maching before watching the finale for biggest loser. Don’t miss that. That show this year has really motivated my. Last year, not so much with all the fighting and back stabbing. 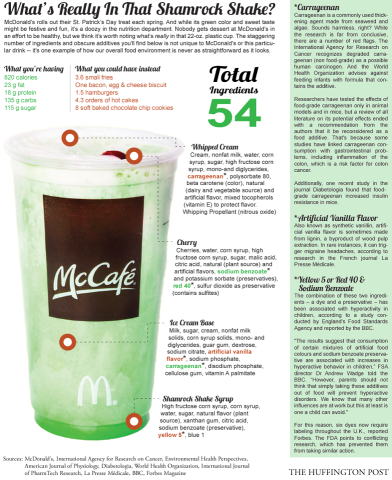 Who knew MCD Shamrock shakes had 54 Ingredients ! I don’t drink these, they have always made me sick…I don’t have to wonder why. Will this be a one time change? Will this be a change in habbit? Will this change affect my health? Like Juicing Vegetables for more Health Articles like This! This information was posted on FB today from Juicing Vegetables with the following link. This looks really good. I am adding this to my recipe box. Juice for a healthier YOU! Alarm goes off at 7:30 AM, snooze once…Drink 1 glass of water. I can smell the coffee…I know, when you juice you are supposed to give up the coffee. I can not yet. I have cut the coffee way down, and water it way down. 10 cups of water and 5 scoops of the Java. I drink 1 cup in the morning and 2 in the evening. Hubby has 1 in the morning and we both like it weak. I don’t miss the cereal and milk I have always had for breakfast. We do make breakfast 1 or 2 mornings a week. Generally egg beaters, onions and spinach with morning star veggie sausage. I do not miss the cheese we used to put in the omelettes. I really thought I would miss cheese. Of all the foods I no longer eat, I thought I would really crave this the most. I find that it’s a mind over matter issue. If you don’t mind…it does not matter. I have lost between 1.5 and 2 pounds a week. It is gradual and that works for me. This is a change I can and will live with. I am not starving, I walk more and my snacks are veggies more than fruit. I love fruit and am a dessert person too. I find that if bananas are going bad, get put into the freezer and taken out when I need a smoothie. They are perfect. I timed myself for 1 week from start to finish. Getting the veggies from the fridge, washing, cutting ends off, pealing cucumbers, juicing, cleaning juicer. I have it down to 20 minutes. My daily juice is mostly the same, just a couple of changes if I feel like a Kiwi instead of a pear, more radish. I need to find a glass container air tight to store the extra juice that does not fit in my 32 oz bottle I bring to the store with me. I used a bottle from the V8 but find even putting that in the dish washer it does not really come clean. Dumped that container recently. What do you use to store your extra juice? I wonder what people think when I walk to work, carrying this 32 oz container of orange colored liquid. I park 1/2 mile from my store so I get 1 mile walking in. It does not matter if its 50 or -20. If you wear enough, you will be fine. I also walk the dog around the neighborhood 3/4 once, my husband does the walk twice. It is beautiful and snowing here in Lake Placid, NY right now. The NCAA Div III hockey championships are here as well as Can/Am hockey which is kids. This is a great place to live and it makes you want to be and eat healthier. I recently had to go to MI as my mother is very ill and was so excited to see Subway with fresh salads, cracker barrel with egg beaters and turkey sausage. We skipped the bread and biscuits for the trip as we have cut them out of our new dining menus. It was very easy to find food to eat. Olive garden with the salad, no croutons, no cheese, no bread sticks and the egg plant parm. No pasta either. That was one of the best meals. I was without my juice machine for the week and really missed it. Crazy I know, but I have grown attached to it and the combinations of juice to make. My husband asked for juice this morning too. His is only veggies. So I did his first and mine after. 6 Carrots, 4 celery, 2 radish, 2 tomatoes and 2 cucumbers, handful of spinach and handful of kale. I decided to not use fruit today to see if I just like the veggies. It was really good. I will put this in my file to keep with the juices I liked. Some of the Juicing variations I don’t care for, but this was really good.